Commander Darren Rushworth was raised and educated in Perth, Western Australia. After completing High School, he then joined the RAN as an Adult Recruit in June 1984. As a sailor, Darren served in HMAS Watson, Perth (DDG) and Derwent (DE) before being selected for commissioned rank in February 1988. As an officer, Commander Rushworth was trained at the RAN College Creswell and then Cerberus to graduate as a Supply Officer. 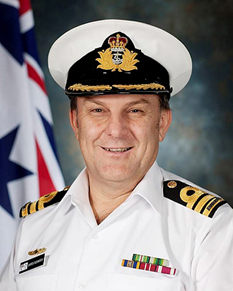 He completed appointments as ILS Manager for Oberon Submarines in Naval Support Command Sydney and as Finance Officer Watson before commencing Seaman Officer training in 1993. Commander Rushworth achieved his Bridge Watch keeping Certificate in Darwin (FFG) during 1994 and remained in this ship for consolidation. Further sea postings have included Executive Officer, Cessnock and, Gladstone (FCPB), Commanding Officer Labuan (LCH), Plans and Operations Officer COMPHIBRON ONE embarked in USS Tarawa (LHD) and, Executive Officer Kanimbla (LPA). Deployments have included Operations RESOLUTE; EAST TIMOR; BEL ISI TWO; CATALYST; SLIPPER; QUICKSTEP; and PADANG ASSIST. His command was awarded the LCH Proficiency Shield in December 2002. During his exchange posting which deployed to the Middle East, he was awarded the US Meritorious Service Medal and the US Navy and Marine Corps Commendation Medal for dedicated professional performance. Ashore, Commander Rushworth has enjoyed Senior Naval Recruiting Officer Perth, Minor War Vessel Sea Training Group, Staff Officer Mine, Amphibious and Support Ship Plans, Operations Officer West, and Staff Officer Junior Officer Postings. Commander Rushworth completed the Australian Command and Staff Course in 2013 where he achieved his Masters in Defence Studies from the Australian National University. More recently, Commander Rushworth was Head of Support and Development at Training Authority Maritime Warfare where he contributed to further advancement in simulation training. Prior to assuming command of HMAS Coonawarra in December 2018, Darren was the Deputy Capability Manager Representative for Amphibious and Afloat Support Group which manages the RAN’s amphibious and tanker ships.